The Keto Diet Cookbook, my newest paperback book, is here! 140+ flexible keto recipes for every day. When you share the recipes you love from the book, you’ll be entered to win prizes weekly, for the next 10 weeks! Today’s the day! Book release day, that is. We do the keto diet because we wanna lose weight, control appetite, increase mental focus, boost energy… all the good things. And we want RECIPES that’ll get us there. That’s where my newest paperback, The Keto Diet Cookbook, comes in! 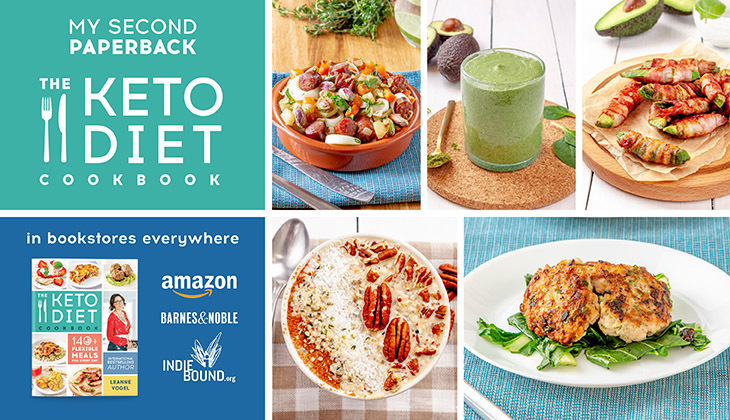 It’s got 140+ delicious recipes for complete keto meals, and that’s just the start. To celebrate the launch of the book, we’re giving away ALL the keto things (below). Do you have a copy? If yes, SCROLL DOWN to see how you can win! 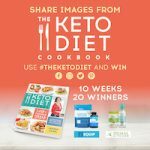 How Is The Keto Diet Cookbook Different from The Keto Diet? The Keto Diet has in-depth information about how to follow a ketogenic diet and build a program that works best for your body. In The Keto Diet Cookbook, the focus is all on the food: how to structure your meal plans, how to plan meals based on your goals, what foods to choose, which foods will get you closer to your goal, how to shop for those foods. Plus, the most exciting feature of the whole book: The Keto Diet Meal Planning System! The Keto Diet Meal Planning System provides readers with 3 templates to follow based on their meal planning needs. In one of the templates, you’re guided through determining how much food to eat based on your goals, you’re provided a meal planning combination to follow, and then each of the recipes in the book can plug into your specific combination. SCROLL DOWN to see how you can win when you have a copy of the book! Every time you share a picture from the book (you posing with the book, recipes from it, etc.) 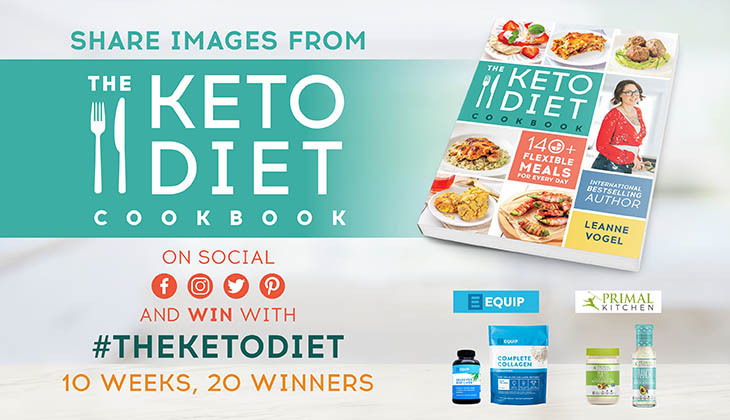 on social with #theketodiet, you’re automatically entered to win…. drumroll, please…. The giveaway is open from April 9 to June 16, 2019. Just use #theketodiet when sharing and you’ll be instantly entered to win! Two winners will be randomly drawn and contacted via the social media channel where the winning draw originated. They will have 24 hours to respond to the contact before another winner is chosen. The giveaway is open to US and Canadian residents. I’m hosting various virtual book readings from April through June where I’ll be reading from my paperback books, The Keto Diet Cookbook and Keto for Women + answering your keto questions. Follow me on Instagram and watch for the alerts to join live! Don’t have Instagram? All good! You can also join the live on YouTube. As soon as you have a copy of the cookbook, PLEASE take a couple of minutes to review on Amazon here and review on Barnes & Noble here. Your honest review will help others find the book, and could potentially help me get the book on some bestseller lists. Yeah! In The Keto Diet Cookbook, simple is the name of the game. I crafted each recipe based on your feedback: you wanted quick keto meals using uncomplicated and accessible ingredients that you can make in a hurry. You wanted to be able to make delicious recipes from a handful of ingredients to create nourishing keto meals. I made this book for you, and I couldn’t have written this book without your support. Thank you for being part of this journey!